Those who think the IPO market is in the pits have short memories. 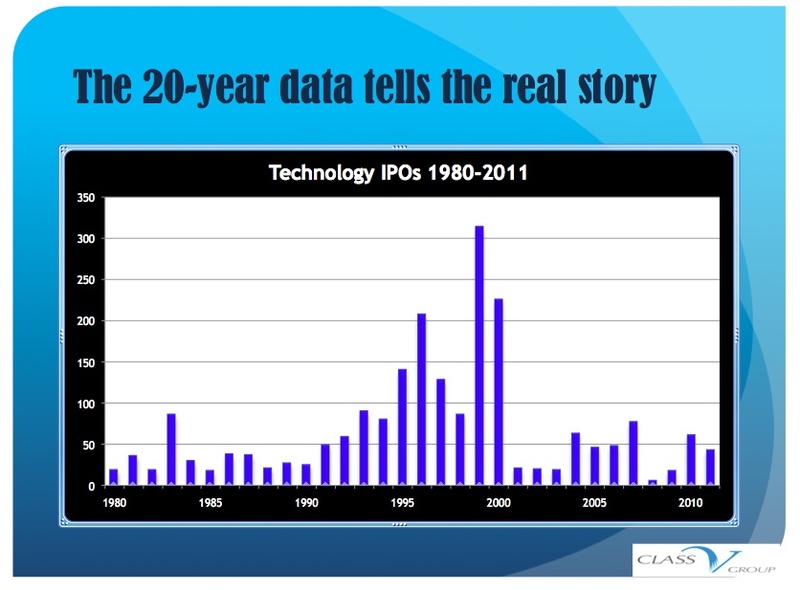 If you look at historical data over the last 20 years, you will find that the bubble of the late 1990s was the exception, not the rule, when it comes to IPOs. Isn’t that why they called it a bubble? Lise Buyer, founder of Class V Group, which counsels startups on IPO strategies, says people with only a decade of IPO experience have a skewed view. 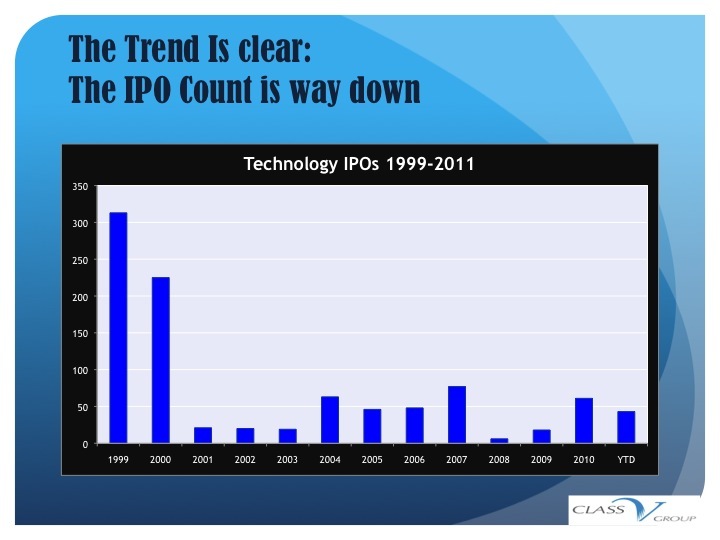 “There is so much talk about how the IPO market is broken. Well, go back 20 years, look at the data. Maybe when times were abnormal isn’t now, but the 1995 to 2000 bubble,” said Buyer, who compiled the data for an E-trade-sponsored (s ETFC) panel at the GigaOM RoadMap Conference. 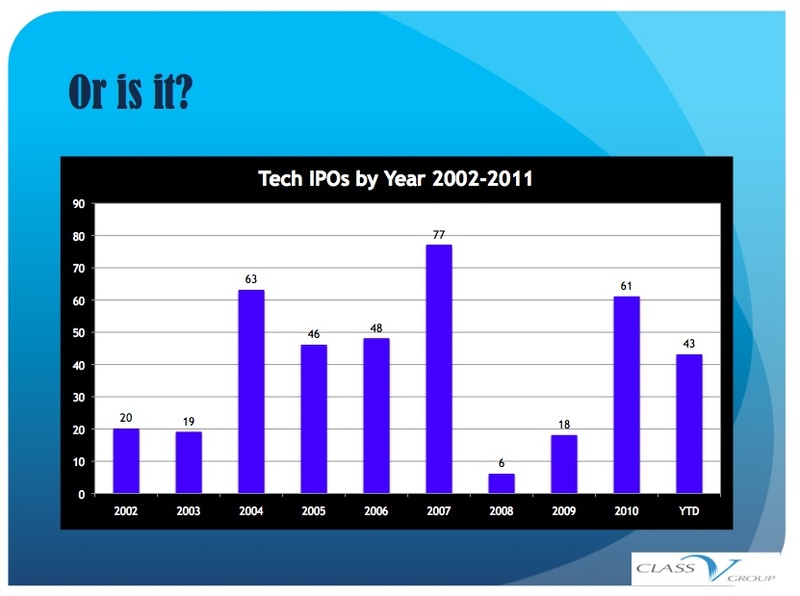 Buyer knows a little something about IPOs. She was a buy-side analyst for T. Rowe Price before joining Google (s GOOG) to help guide that company to its wildly successful IPO in 2004. In her view, 75 percent of those “bubble” companies — names like Pets.com, Webvan and other poster children of dot.com bomb excess — should never have gone public to begin with. The recent Groupon IPO (s GRPN) may be a sign of the bubble resurging. Skeptics point to the fact that $900 million of the $1.1 billion Groupon raised went to early investors. The perception that only a privileged few insiders can actually make money off an IPO is something that could break the IPO market. Many wrote at the time of the launch that new investors should run, not walk, away from Groupon shares. Buyer said that’s the kind of thing that could really kill the market for IPOs. Her view is that companies have to earn an IPO, do the research, do the investment, and be transparent about it. On the other side of the aisle are those who say it’s already way too hard to go public. Count among them panelist Michael Moe, CEO and founder of GSV Capital. Moe said regulations and red tape are keeping even big tech companies out of the IPO race. They want to stay private longer, to avoid these hassles. “Sarbanes-Oxley is just one issue. I don’t know a CEO in Silicon Valley who wants to be public,” he said. Currently, a privately held company with more than 500 investors must share financial information with them. There is a move afoot to boost that limit to 2000 investors. Others argue that as companies take on investors, they take on responsibilities. “By the time you have 500 investors, it’s not just your buddies anymore and they need to know what you’re doing,” Buyer said. The idea that the “poor, struggling Zyngas and Facebooks of the world” can wait till they have 2,000 investors before they have to disclose, doesn’t pass the smell test for her. Companies that want to go public have to jump through the hurdles and prove themselves.